Maxim Care Moist - In Shampoo & Conditioner - Cleanse, Condition & Pamper Your Hair Using a collection of herbs and Emu Oil. Lather and cleanse the days' dirt and stress from your hair with a collection of herbs and nature's own oil found in Maxim Care Moist - In Shampoo and Conditioner. 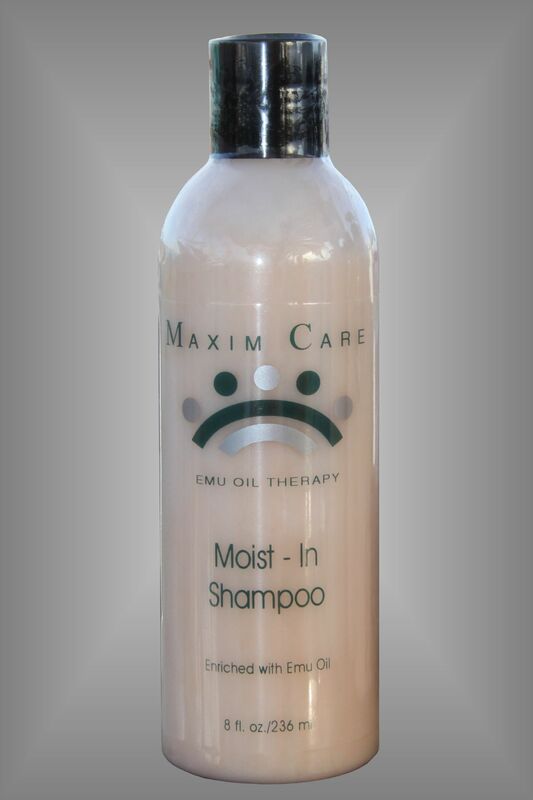 The Maximum amount of Emu Oil is included in all Maxim Care products for the most beneficial results. The featured ingredient, Emu Oil is a natural oil which is anti-bacterial, anti-microbial, and hydrates the skin and hair shaft quickly and deeply. In addition to Emu Oil our special formulation is rich in nourishing EFA's and the purest botanical extracts including Sea Weed Extract, Aloe Vera Extract and Chamomile. Our refreshing lemon-orange fragrance of our Maxim Care Hair Collection is aromatically designed to soften your mood, allowing you to unwind as you cleanse and condition your hair and wash away the days stress. No oily residue remains on your hair. Maxim Care Moist - In Shampoo strengthens and protects while hydrating the hair shafts, leaving your hair incredibly clean, soft, manageable and full bodied, giving it that healthy-looking voluminous shine day after day! Balanced with the essential oils and Emu Oil, this concentrated product restores moisture loss caused by the environment and over-processing. This moisture rich shampoo is also great for dryness and psoriasis of the scalp. For the ultimate in your hair and scalp health try our Maxim Care Grape Seed Conditioner. Pamper your hair using our advanced hair care for cleansing and conditioning. Directions: Apply a dime size amount of this highly concentrated creamy shampoo to the palm of your hand. Massage into scalp. Rinse. Repeat as needed. Ingredients: Sodium Lauryl Sulfate ( naturally derived from coconut oil), Sodium Cetyl Sulfate, Laureth 3, Emu Oil, Glycerine, Glycol Stearate, Sea Weed Extract, Aloe Vera Extract, Calendula Extract, Linoleyl, Linolenyl Dea, PEG - 75, Lactic Acid, Germaben IIE, Essential Oil Blend.